Raumfahrt+Astronomie-Blog von CENAP - Blog: Raumfahrt - Nach Rosetta: so geht es weiter für die Europäische Raumfahrtagentur! “Rosetta is dead, long live Rosetta,” Patrick Martin, Rosetta’s mission manager, declared on receiving today’s confirmation that the $1bn spacecraft had hit the comet 67P/Churyumov-Gerasimenko, bringing its journey to an end. 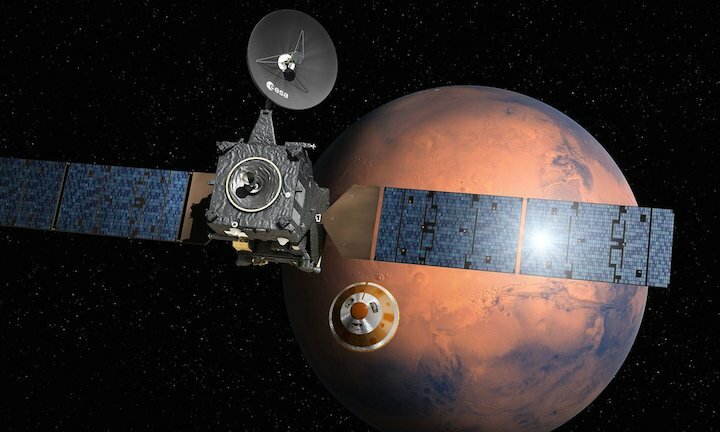 The Exo Mars mission is already underway, with its Schiaparelli module due to land on the planet on 19 October. The second stage of the mission will kick off in 2020 when the Exo Mars rover is launched. ESA’s Solar Orbiter (SOLO) is scheduled to launch in October 2018. It will observe the turbulent surface of the sun in unprecedented detail and measure the solar wind. Planned for launch in 2022 and arrival in 2030, ESA’s deep space JUICE (Jupiter Icy Moon Explorer) probe will spend at least three years observing the giant gaseous planet Jupiter and three of its largest moons, Ganymede, Callisto and Europa. If approved in December, ESA’s Asteroid Impact mission (AIM) will launch in October 2020, and head for the binary asteroid system, Didymos, and ultimately crash a probe straight into the smaller of the two, known as Didymoon. Jan Woerner, ESA’s Director General also said this month that a moon village - a permanent, manned outpost - should be a long-term goal in space exploration.